Too much normality scares me. Is there a saying, normal is as normal does? Does that sound exciting? No. Give me a touch of eccentricity every time. 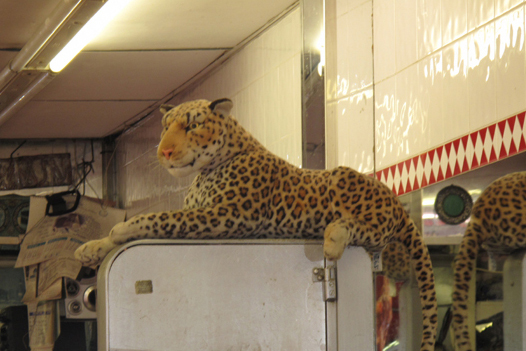 Could be in the shape of a leopard, stuffed and resting on the refrigerator of a butchers on Rye Lane in Peckham. That’s my kind of neighbourhood and my kind of normal. This entry was posted in Peckham, Photography, Writing and tagged leopard, normal, Peckham, south London, street photography. Bookmark the permalink.